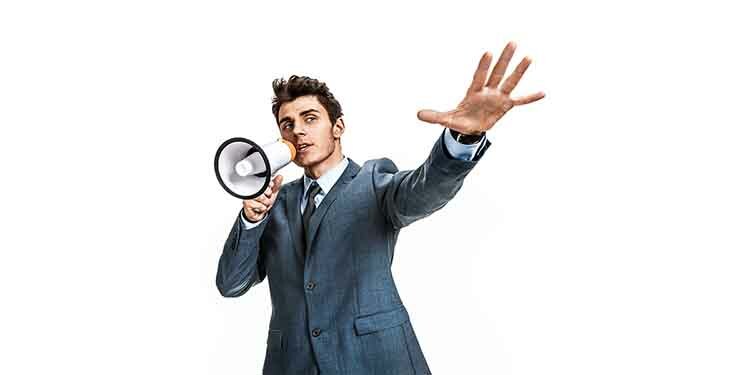 Since Ancient Greece, people have valued highly the art of public speaking. Indeed, consider the most powerful people in the world: heads of state, government officials and politicians are all known for their skill to impress and persuade. They know how to use the oral word to conquer the attention and appreciation of other people. If you become nervous on stage, or just want to polish your speech skills, look at these tips. When the audience is numerous, it can be intimidating. One can simply get confused because they do not know where to look. To seem confident and present, you should alternate between three different ways of maintaining eye contact. Direct, when you catch a friendly face, you can pretend that you are speaking to them personally. Broad sweeping, when you look at the audience as a whole. You address it as if it is one creature, but do not focus on one face only. Gazing into the distance, when you choose a particular spot in the back on the room, or try to look as far away as possible if you are outdoors. It might seem silly, but do not forget to breathe. Regulating your breath not only helps with providing the necessary oxygen to remain conscious, but also is a great help towards making logical pauses in your speech. If you want to stress on a concept, or let your information sink in, take a three-second break to breathe after your final word. Find a recorded speech of a politician online and notice the details of their breathing patterns: they do not run out of breath or speak too fast, do they? Self-confidence is the key. Even if you are not a self-confident person, try to appear as one. That does not mean chewing gum or putting your hands in your pockets though! Stand straight, do not fumble with your hands and give out a bright smile. Choose your outfit and accessories carefully: do not dress up too much because it will distract your listeners, but also pay attention to style. When you are preparing for the speech, choose a soundtrack that will make you feel fearless, and keep that music playing in your mind when you are on the stage. Keeping a group of people interested and present for more than twenty minutes, or ten minutes for children, is almost impossible. That is why you need to cut out mercilessly all the unnecessary information. It is better to talk clearly and slowly, than pour a rainfall of details. The longest inaugural speech of a USA President was by Harrison, took up two hours and earned him pneumonia that caused his death not a month later. The shortest inaugural speech was by Washington, took up three minutes and preceded the most important administration in the history of the country. Whose speech was better?